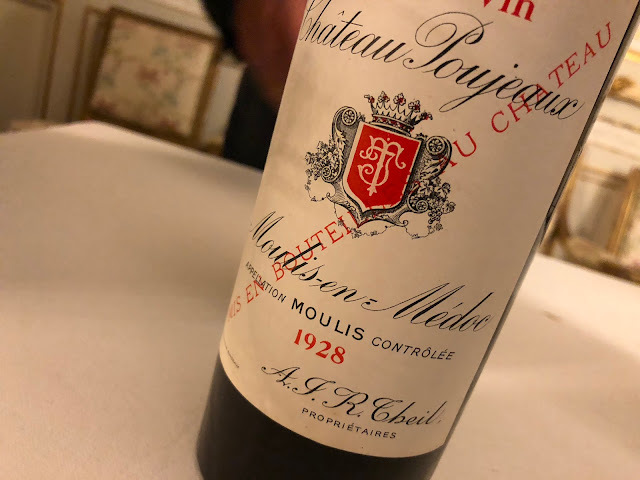 In my previous posting I wrote about my general impression of the Bordeaux 2010 vintage, and I finished with the promise to share with you my personal favorites. In the meantime many wine critics have published their tasting notes, some of which you can find on Bordoverview, and around Wednesday Robert Parker's verdict is expected. 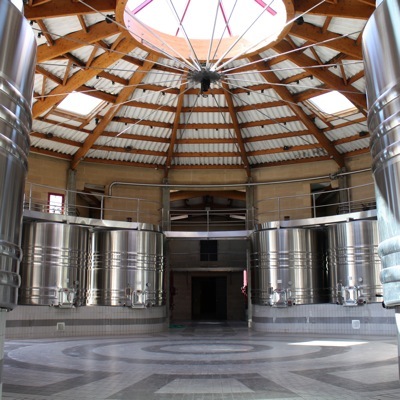 I was "Totally blown away by the quality of Pontet-Canet 2010." Here you see the château's new concrete vats perfectly lined up. But for those of you who are interested in my favorite Bordeaux 2010s, here they are. For some wines I reprint the tweets that I posted right after having tasted the wines. Of course I can rewrite these, polish 'em, but raw like this they're straight from the heart, grabbing the essence. 1. 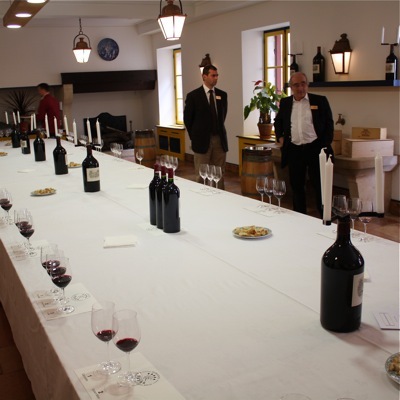 Pontet-Canet 2010 "Totally blown away by the quality of Pontet-Canet 2010. Splendid purity, great expression & harmony. Well-shaped, no hardness. Alive! #bdx10"
2. Ducru-Beaucaillou 2010 "Great wines @ Ducru-Beaucaillou! Fourcas & Lalande Borie made for Drínking #mm Croix serious 2nd wine. Ducru grandiose "Beau Caillou"! #bdx10"
3. Vieux Château Certan 2010 "Vieux-Ch-Certan top. Juicy purple fruit, spirited. Mineral, pure. Strength. 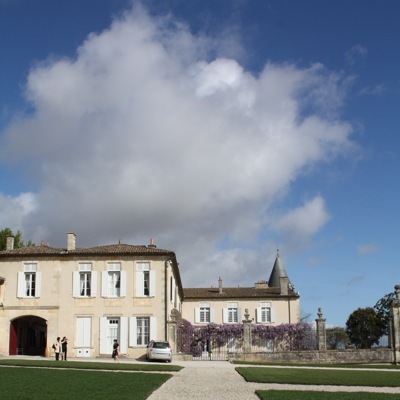 Other r'ded Pomerol: Petit Village, Conseillante, Clinet #bdx10"
4. Lafite Rothschild "Lafite: natural beauty, nothing forced, subdued elegance. Duhart attract. classic w/ fraîcheur. Carruades pure, lenient, quite lovely #bdx10"
5. Haut-Bailly 2010 "Lunch & tasting @ 1 of my favourite châteaux: Haut-Bailly. Always standing out for its purity and terroir expression. 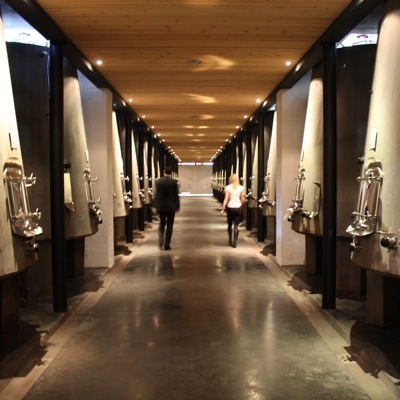 Great Parde too #bdx10"
The tasting room at Château Lafite-Rothschild. Here we tasted the Lafite, the Carruades and the Duhart-Milon. 1. Petrus 2010 "Ch Petrus. Breathtaking. The mouth gets paved with luscious layers of dark fruit, velvety tannins, chocolate etc. Oops forgot to spit #bdx10"
2. Ausone 2010 "Ausone impresses. A broad blanket of generous purple fruit & ripe chewy tannins unrolls in the mouth. All is there, veiled, balanced #bdx10"
3. Latour 2010 "Freshness for Latour & Forts: beam of acidity + gravelly character open these ripe wines. More depth & darkness for Latour. Precision #bdx10"
4. 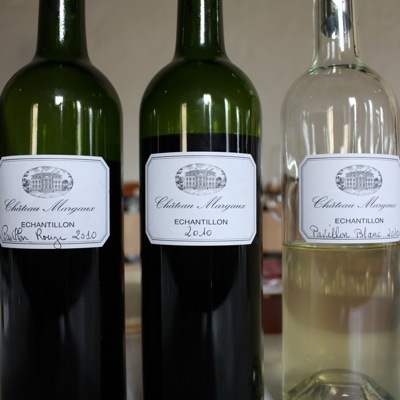 Margaux 2010 "Chât Margaux more serious than Pavillon, tighter. Pure, bit chalky. Rare Pavillon Blanc (100% sauvignon) delicious, fresh, rich, soft #bdx10"
5. Palmer 2010 "Today's last visit was Palmer. Fruity convincing Alter Ego, in '10 more power than usual. Great Palmer too. Pure wines, fine tannins #bdx10"
Tasting at Château Margaux. Lovely Pavillon Blanc also! 1. Grand-Puy-Lacoste 2010 "Grand-Puy-Lacoste & Haut-Batailley beautiful, complete classics with lovely freshness. Calon-Ségur hearty, dark, good. Next: Montrose #bdx10"
2. Trotanoy 2010 "Favourites @ Moueix: Magdelaine, Certan (dMC), Fleur Pétrus, Hosanna and finally, brilliant Trotanoy, liquid terroir wow! Next Petrus #bdx10"
3. Guiraud 2010 Refined, delicate and with a striking, very attractive freshness. A well balanced and elegant Sauternes. 4. Domaine de Chevalier 2010 "Horses in the Dom de Chevalier vineyard. Energetic & lively wines. Blanc: elegant, fresh. Red: hearty juice, spicy, finesse. Recomm'd #bdx10"
5. Léoville Barton 2010 "Last stop this morning: Léoville Barton. Langoa vivacious, fruity, intense. Léoville ripe, racy, tight & fresh. Classic forward style #bdx10"
The spaceship-alike over-the-top cellar at Château Cos d'Estournel. I liked the wines better than last year, there's more elegance it seems. I love Château Haut-Brion's medieval, terse, fairytale-like style. A bit like the compact wines this year. 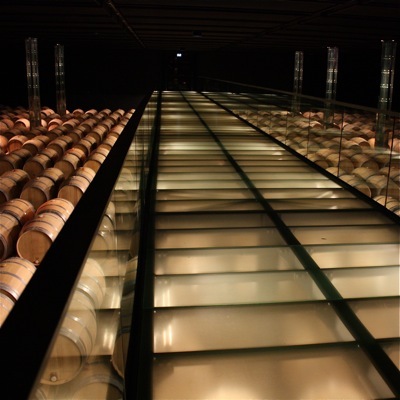 The beautiful, 'open' cellar at Domaine de Chevalier. You don't have to become a mole to work here. The Bolomey Wijnimport offers can be followed on www.bordeaux-2010.nl for those who are interested. Agree fully with list E, missing however Pomerol on this list La Pointe perhaps? Also Ormes de Pez could be included on this list. Perhaps, but I wasn't sure for these wines. In my notebook I see that La Pointe showed an attractive freshness but the wine did not convince me, it came across a bit meagre. Ormes de Pez is a wine I 'normally' like, or even like very much, yet the 2010 was a bit disappointing. It was quite oaky I remember, and that's something I don't like. But the rest of the TN is rather positive and this oak-thing might also be something temporary which stood out in our sample. Thanks for your comments as I have based my comments on my previous experience and the info on Bodoverview, by the way the links and comments there for 2009 should now be replaced by 2010! Will follow the prices for your list E wines on your Bolomey website. In the context of soaring prices for top Bordeaux, many traditional markets have posed the well-publicised question of whether the region has determined to part company in the pursuit of a more profitable clientele. For the traditional claret drinker and indeed the wider-public, however, Bordeaux remains of tremendous relevance as the classic wine region where the under-hyped Petit Chateaux and Cru Bourgoisen have much to offer. 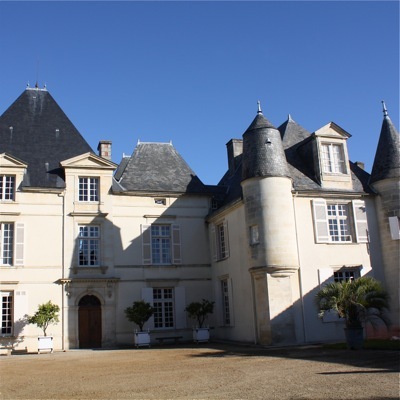 Such chateaux have something interesting to say about the place in which they are grown, which for many who consider wine as more than an investment, is by far the most interesting thing about fine wine, be it £6 or £600. Indeed, if 2010 price releases to date are an indication – the lesser-known wines are thus far +5 & -10% off of 2009 prices with quality very high - these will likely provide among the most rewarding drinking for some time to come.